Rita Dove has 1 media appearance. Rita Dove, a former U.S. Poet Laureate and Pulitzer Prize winner, shares her favorite poems by other poets in addition to reading her own work. 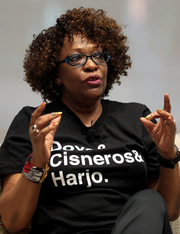 Rita Dove promotes The Penguin Anthology of Twentieth-Century American Poetry. Rita Dove signs The Darker Face of the Earth. Rita Dove signs Sonata Mulattica: A Life in Five Movements and a Short Play. Rita Dove discusses American Smooth. RITA DOVE reads from Sonata Mulattica: Poems. Rita Dove's book The Art of Losing was available from LibraryThing Early Reviewers. Rita Dove is currently considered a "single author." If one or more works are by a distinct, homonymous authors, go ahead and split the author. Rita Dove is composed of 5 names. You can examine and separate out names.